NAUTICAL HAVEN is 0-8 on the all-weather tracks but hasn't run on this surface and distance but looks as though further would suit it better so not for me. BROADHAVEN HONEY is my 3rd top rated but that is using a 2017 time, it is a possible pacesetter but needs to bounce back to form so not for me at 7/2 I would lay it. SKY GYPSY has led before but as it looks as though further suits it better it might not be able to lead here so another that's not for me, 13/2 looks a decent price to lay it at. DANEHILL DESERT hasn't any runs on this surface and distance but a decent time from its turf form means I cannot discard it but neither could I back it as there's very little form to work with. SWENDAB is a versatile type with its tactics but is only 5th on my figures and may struggle to get a clear run in the early stages from stall 4 in the make-up of this race. 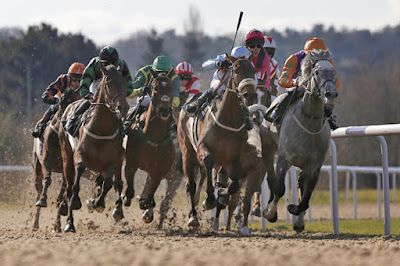 *OUR MAN IN HAVANA another front-runner and my top-rated its recent form looks as though it's being primed for a tilt on the all-weather and now down to its favoured distance. ANOTHER ANGEL hasn't any course form but is 3rd best using a Newcastle time stall 3 isn't ideal in this particular race but will be staying on at the finish and could make the frame. ASTROPHYSICS also has no course form but is 2lb better on Newcastle times and my 2nd top rated but its been drawn widest of all but could make the frame. TEEPEE TIME has only produced slow times for quite a while now and this isn't its favoured surface so it looks a lay to me at 10/1. SUMMARY: Red Stripes could be dangerous against the rails if allowed to set its own pace and may make the frame, my 2nd and 3rd top rated horses both did their best times at Newcastle so may not handle the bend as well as others but either or both could make the frame but if OUR MAN IN HAVANA 20/1 repeats its best time it would win cosily here and the price means I will have an each way wager but I will probably have a covering bet on RED STRIPES 13/2 as it could go well from the prime draw against the rails.